Listening Example: Ohio State University Marching Band Tribute to "Disney"
Have you ever watched a High School or College football game? Have you ever watched a parade on TV? If you have, chances are you’ve seen a Marching Band. A marching band is a group of musicians who play instruments while they march. Sometimes, they march on a football field, and sometimes they march down the street in a parade. 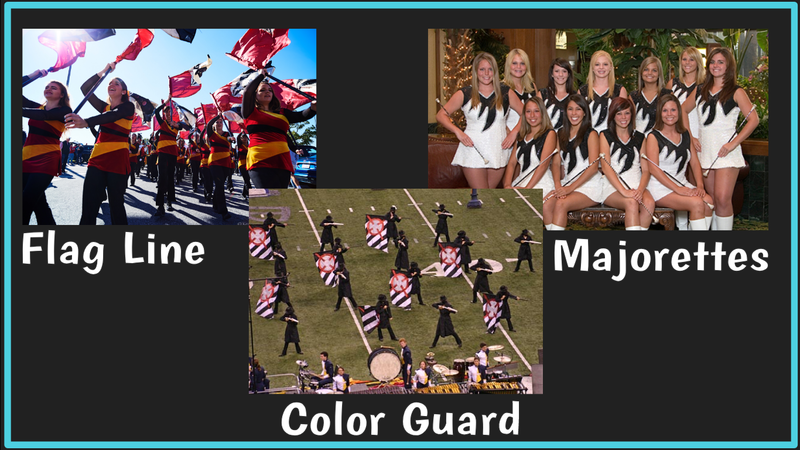 This week, we will explore 5 different college marching bands, and the different things that make a marching band performance so exciting. 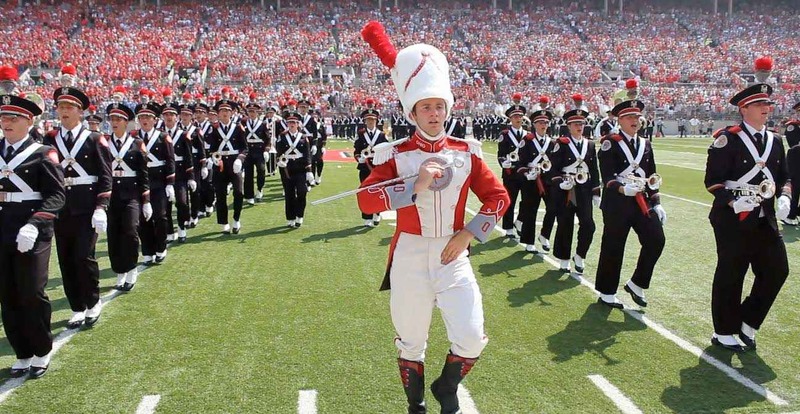 Today’s Listening Example is the Ohio State University Marching Buckeye band. Ohio State is located in Columbus, Ohio. It is one of the few collegiate all-brass and percussion bands in the country, perhaps the largest of its type in the world. The band has also performed in seven Inaugural Parades. The band represented the State of Ohio during the inaugurations of Herbert Hoover, Richard Nixon, George H. W. Bush, George W. Bush, and Barack Obama. Today we will see their tribute to Disney. Watch how skillfully and precisely the musicians move while they play their instruments. 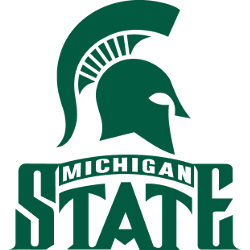 Listening Example: Michigan State University Drumline performing "X"
The main attraction of most college marching bands is the drum line. What instruments do you think you might find on a drum line? 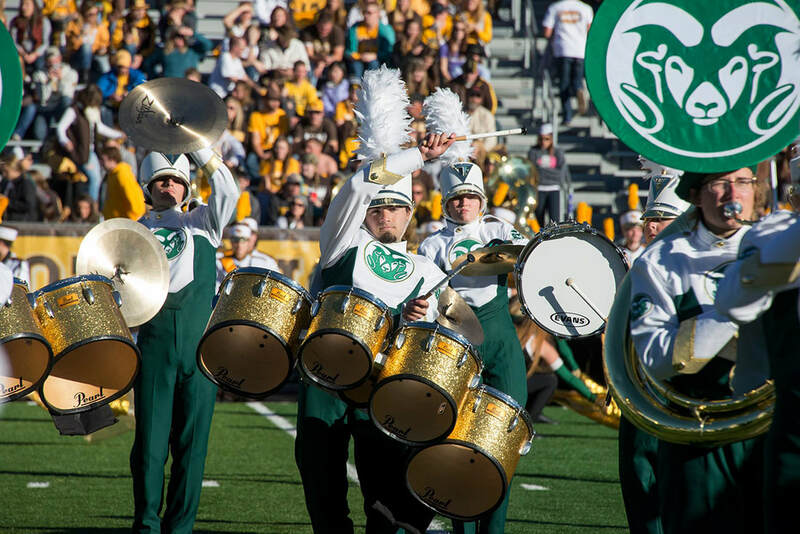 Typically, the drum lines we see in marching bands include snare drums, tenor drums, bass drums, and cymbals and are responsible for keeping tempo for the band. 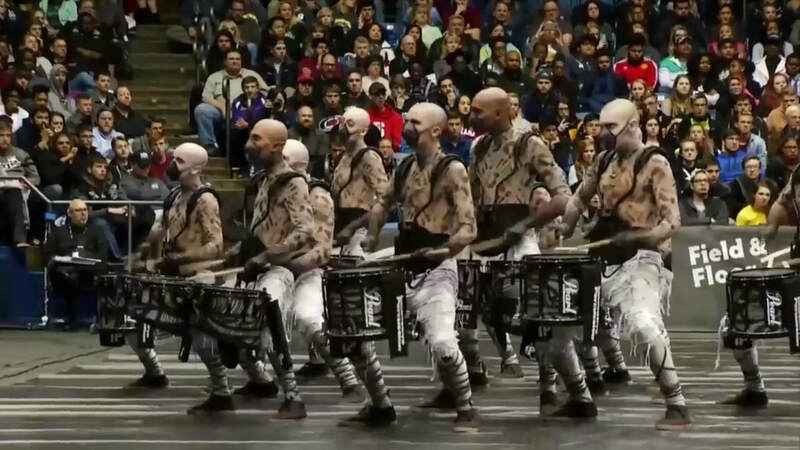 The drumline is best known for their tricks, such as dancing, tossing instruments or sticks, switching drums mid song and even acrobatics. They do all of this WHILE playing the drums and keeping the tempo going for the entire marching band. 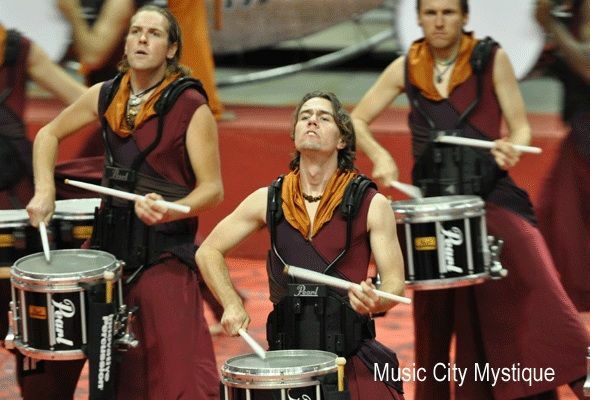 Being on a drumline is so fun, that people have created ways to be on a drumline without even needing a marching band. 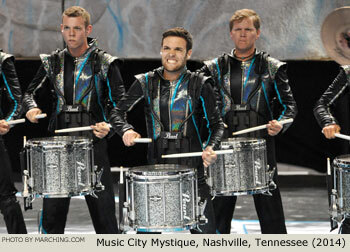 Music City Mystique is a world-renowned theatrical percussion ensemble, or drumline, based in the music capital of the world: Nashville, Tennessee. The group competes internationally, and is an eight-time world champion. This non-profit youth ensemble consists of approximately forty performing members between fourteen and twenty-two years of age. Today’s listening example is the Michigan State University drumline. Watch their drumsticks. They all seem to move in perfect synchronization. These musicians have to be very precise in the way they play their instruments, the way they stand, and the way they move their bodies. Listening Example: University of Alabama's Million Dollar Band performing "Happy Days are Here Again" and "Best Day of my Life"
Marching bands can be defined by the style of marching they do. There are three different styles of marching: Military Style, Corps Style and Traditional Style. Military bands were historically the first marching bands. The instruments in these bands usually consists of brass, woodwinds, and percussion. Military marching bands typically march in a forward direction with consistent straight lines. The music is performed at a constant tempo of 120–140 beats per minute to match the steady marching of the entire military group the band is playing with. The marching step size, or interval, is consistent, and usually at a 6 to 5 (six steps per five yards) or 8 to 5 (eight steps to five yards). Unlike the military band style, drum corps style step sizes are constantly changing to accommodate the differing forms the band is creating on the field. Unlike a military band's use of baton twirlers, Corps Style bands may include a "color guard" that spin flags, rifles, sabres—and may also incorporate dance. Other visual elements unique to the corps style is the usage of props, backdrops, and even costuming – with the purpose of adding more theatrical elements to the show. 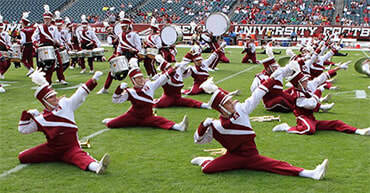 Traditional Style bands, also known as Show Bands, are marching bands geared primarily towards crowd entertainment and perform on football fields. Typically, they perform a routine before the game, another at halftime, and sometimes after the game as well. Competitive show bands perform only one show that is continually refined throughout a season, while bands that focus on entertainment rather than competition usually perform a unique show for each game. Today’s listening example is the Million Dollar Band, which is just the nickname for the marching band at the University of Alabama. Why are they called the Million Dollar Band? The story the University tells is that during the 1922 football season, Alabama visited Georgia Tech and got blown out, 33–7. 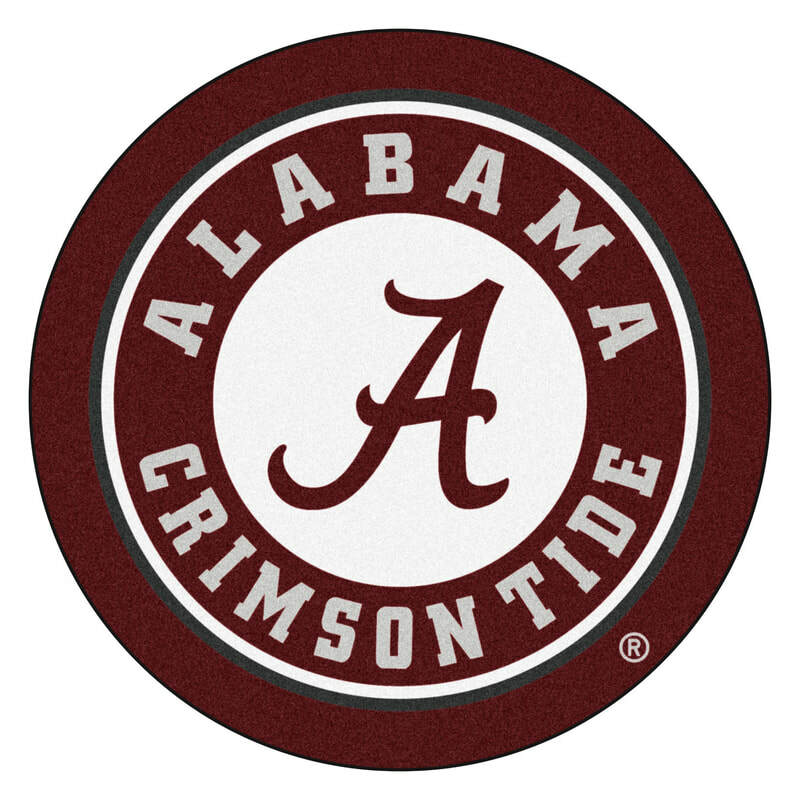 Champ Pickens, a notable Alabama alumnus who was present at the game, was asked by a local sportswriter, "You don't have much of a team, what do you have at Alabama?". In response, Pickens quipped, "A million dollar band." His inspiration for the term came from his observation of the impressive effort the small band had put into soliciting funds from local merchants in order to accompany the football team to off-campus games. Every college marching band tries to perform their shows with lots of flare. 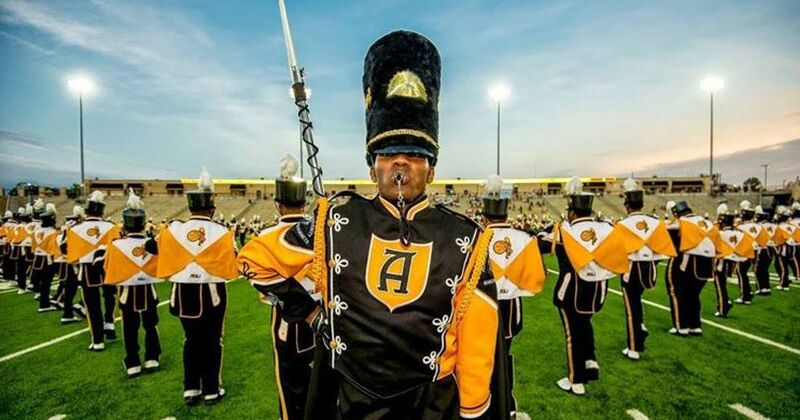 In order to have that flare, they have to do something other than just have people in uniforms walking around a football field playing instruments. That is where the flag line, majorettes and color guard come in. A majorette is a baton twirler whose twirling performance is often accompanied by dance, movement, or gymnastics. The flag line is a group of people, usually girls, who dance while carrying, twirling and flying flags. They often wear costumes that match the theme of the music the band is playing. Flag line has become so popular that there are not competitions just for the flag line and color guard performers. The Color Guard usually brings rifles, sabers, and knives to the marching band performance. They are usually wearing military type costumes, but sometimes their costumes match the theme of the show being performed. Traditionally, the color guard has been mostly women, but men are starting to join since, like flag line, color guard competitions have increased in popularity. The Color Guard also "presents the colors" or carries out the flags for the National Anthem at the beginning of the game. 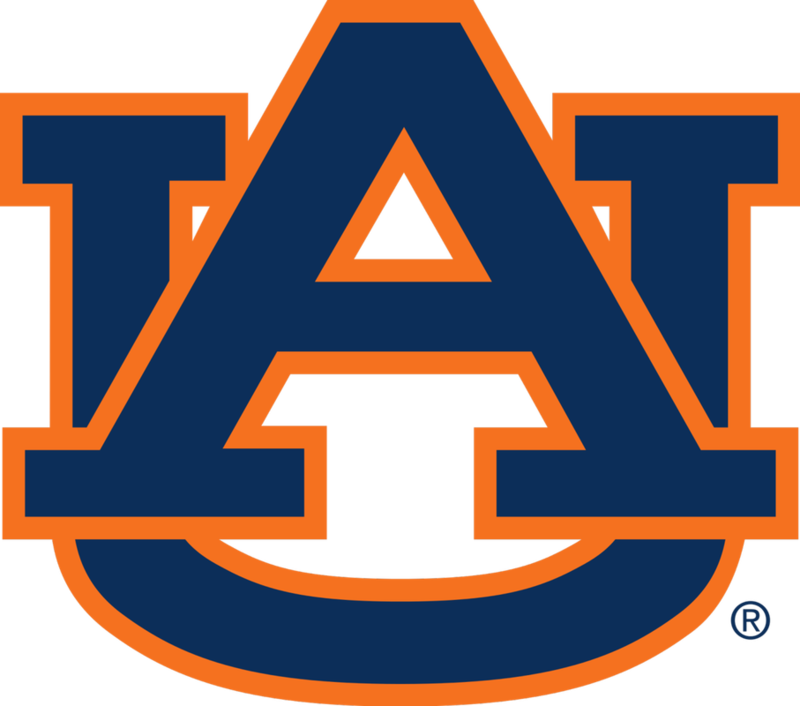 Today’s Listening Example comes from Auburn University in Auburn, Alabama. 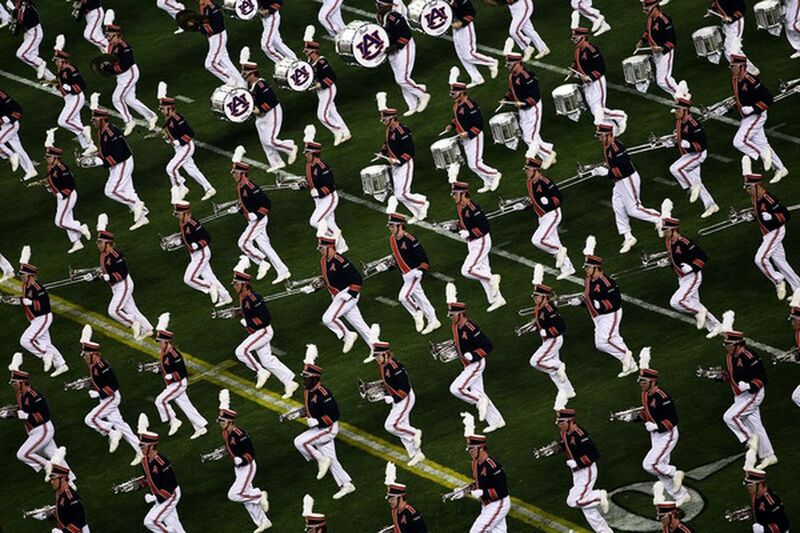 The Auburn University Marching Band has built an international reputation for its precise, entertaining, and colorful performances on the field, unyielding and spirited support for its sports teams, and prideful ambassadorship for Auburn University. 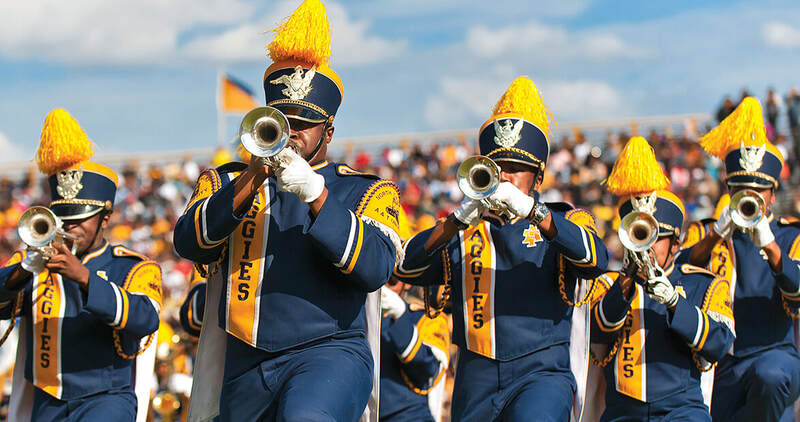 The marching band was named the 2004 recipient of the Sudler Intercollegiate Marching Band Trophy, the nation’s highest and most coveted award for college and university marching bands. This week we have watched different marching bands and learned about parts of the marching bands. Today, we are going to talk about one of the most important people in the marching band. The Drum Major! A marching band is typically led by one to three or, occasionally, four drum majors, also called field commanders, who are responsible for conducting the band. 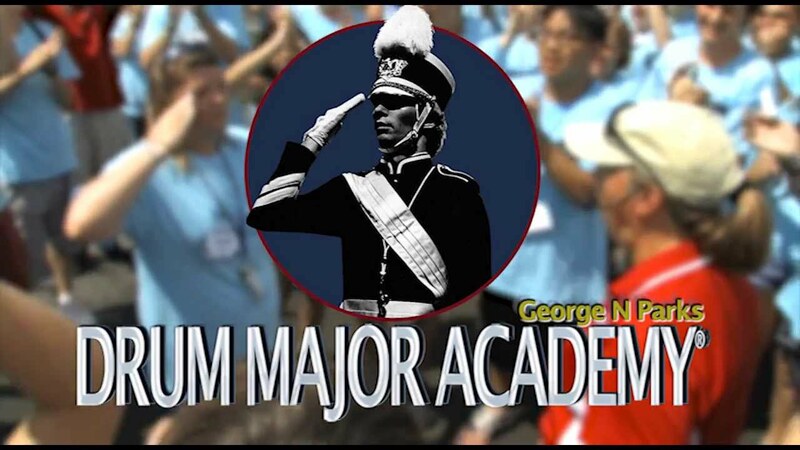 The modern-day concept of the Drum Major has been exponentially expanded upon by George N. Parks, often known as the "Dynamic Drum Major," through his Drum Major Academy. Parks directed a marching band for 33 years which led him to the idea of a school just for those students who were chosen to be drum majors. At his school, students can learn conducting techniques, communication skills and, in general, how to be a good leader of a band. 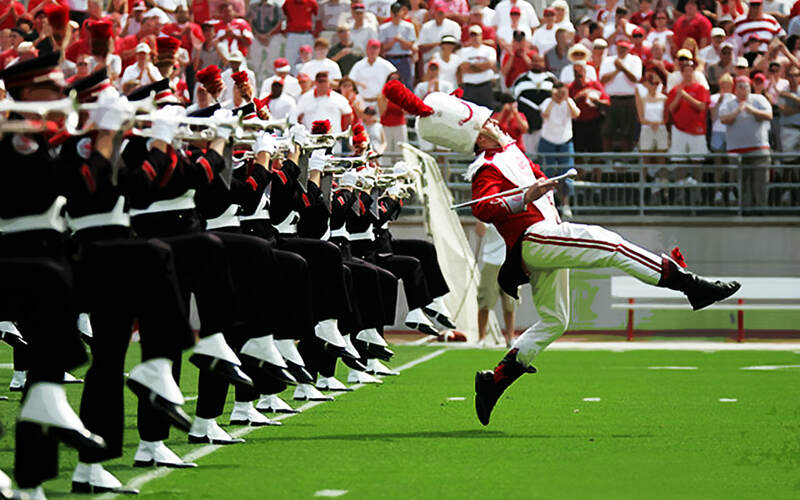 In the marching bands you see at college football games, the Drum Major has to be, not only the leader of the whole band, but he is also a performer. Often times, drum majors have to be able to twirl batons, do flips, and dance! A drum Major really has to be a stellar performer and musician. Today’s Listening Example is from Southern University and A & M college located in Baton Rouge, Louisiana. This band has earned the nickname “Human Jukebox” because they are able to play any song that you want. The Human Jukebox band features a group of dancers called the “Dancing Dolls.” These ladies have danced their way to the Superbowl half-time show with Madonna and onto a video with Beyonce. The drum major for this band is a performer who dances as well as leads the band. 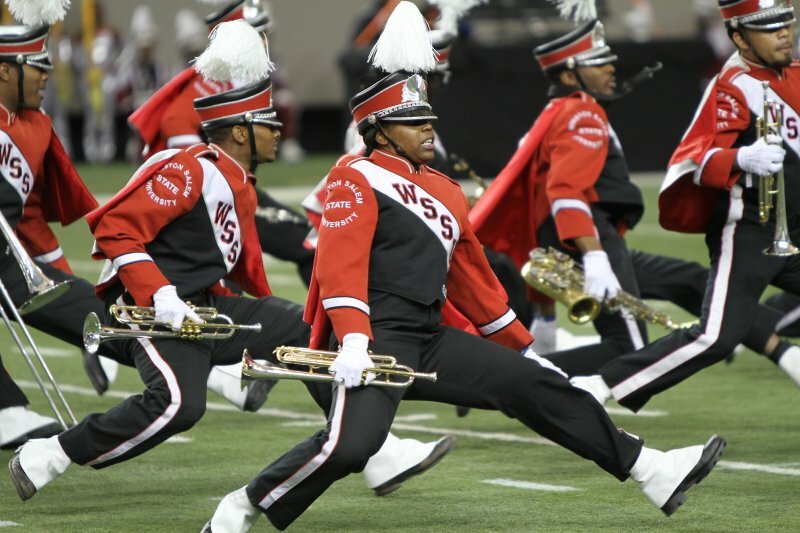 Doing a back bend until the hat touches the ground is a signature move for all drum majors at Southern University. Can you spot the drum major?